Over two years since landing on the gravely floor of Gale Crater on Mars, NASA's Mars Science Laboratory rover, Curiosity, has reached the base of its primary mission goal, Mount Sharp: a 3-mile-high mound of sediment that preserves a geologic record of Mars going back billions of years. "It is an exciting time and a huge milestone since we have finally arrived at the base of Mt. Sharp … the destination of the Curiosity rover," says Dr. Paul Mahaffy, Principle Investigator of the Sample Analysis at Mars (SAM) team at NASA's Goddard Space Flight Center. "There is plenty of evidence in our new site, named the Pahrump Hills, of flowing water, and the outcrops to be explored at this location is in a geological formation called the Murray Formation." Curiosity's SAM instrument will heat samples of the outcrops to hundreds of degrees and analyze the gases released for signs of organic compounds that could have survived Mars' harsh radiation environment, as well as other inorganic compounds. Sampling the chemistry of the lowest exposed layers of Mount Sharp, Curiosity will be reading from a page of Mars' geologic history from the very distant past, and as the rover commences its true climb up the mountain's slope through ever more recent layers of the past its primary mission activity is now beginning. Why did it take Curiosity almost two years to reach the mountain it was sent to investigate? A person could have walked the distance from the landing site to its present location in an hour. Part of the reason, especially during the last year, was for the health and safety of the robot. Some of the terrain it has driven over was rougher than expected and sharp rocks have caused excessive wear and tear on four of its six wheels. Navigating through this challenging terrain required some care, and decisions were made to approach the mountain by a different route than originally planned. 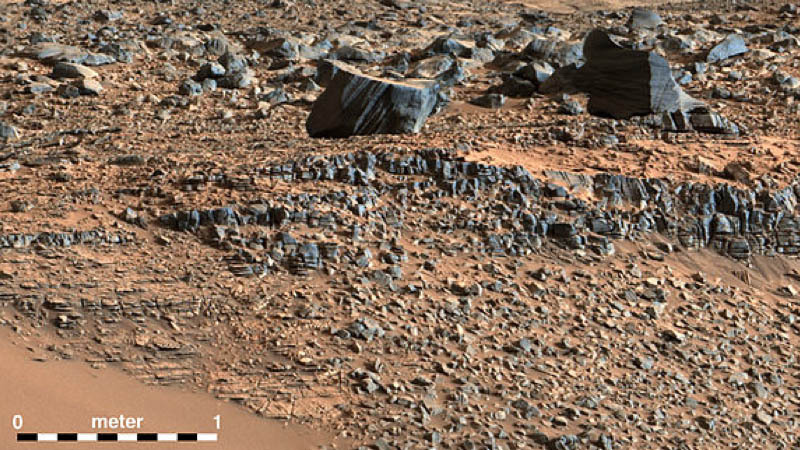 Curiosity spots signs of an ancient lake bed--ooh, shiny! But the greater reason for Curiosity's seemingly slow and casual approach to the mountain boils down to two words: "Ooh, shiny!" "Although Mt. Sharp had been the original destination of the mission," says Dr. Mahaffy, "the Curiosity rover had been diverted from a direct path … by the compelling evidence early in the mission of an ancient lakebed in the opposite direction…. Exploration of the minerals and stratigraphy of this lakebed had realized significant mission objectives of identifying a habitable environment with all the ingredients necessary for life present billions of year ago in an ancient lake." The attractive region, dubbed Yellowknife Bay, kept NASA scientists busy and Curiosity close to its landing spot for nearly a year. And though Curiosity's primary destination was Mount Sharp, its mission is to assess the suitability of Mars' environment in the past for supporting microbial life, so the detour through Yellowknife Bay was time well spent. I know about the "ooh, shiny" compulsion. On many an on-foot exploration of my favorite place, Death Valley, I have experienced the same thing—and since Death Valley has been used as a surrogate for Mars in science fiction and in engineering tests of Mars-bound robots, Curiosity and I are simpatico. So many canyon climbs and ridge crawls and playa strolls that I made were the result of seeing something across the landscape that looked interesting and wanting to check it out. So now the "real" adventure begins on the slopes of Mount Sharp. How far will Curiosity climb, and what will it tell us about how Mars' environment has changed over billions of years? I can't wait to find out. Keep those wheels rolling, Curiosity!